The cover art caught grabbed my attention, the back cover blurb sucked me in, and so I took a flyer on this book. I have to say, it blew me away. It has been a long time since I read something with such an original voice, unique vision, and tremendous imagination. “Caitlin Star and the Rise of the Barbarians” is jam packed with exhilarating action sequences and edge of your seat Indiana Jones/Tomb Raider cliffhanger excitement. So in that sense the comic-book style cover is spot on. But there is so much more going on here. I learned a lot about pre-history and anthropology and archaeology and really appreciated Caitlin’s spiritual journey. This is a fascinating group of characters I became very attached to and the story (especially the ending) is quite emotional for an action oriented book. Intense, epic, exhilarating, emotional, even magical. Just finished this and just loved it...the action, the story, the characters (especially Caitlin). Can't wait to read it again and really hope this author writes more Caitlin Star books. From the opening chapter Caterino engages the reader with his rich, visual style, colorful descriptions, and bold, visceral action sequences. This author is such a confident storyteller with tremendous imagination and a gift for tight as a drum pacing. This is a book where you will keep turning the pages. “Caitlin Star and the Rise of the Barbarians” takes place after an apocalyptic event where most of the Earth’s temperate have become uninhabitable and the remaining human population is estimated to be about 100 million. Exactly how that apocalyptic event came to be is one of the story lines of the first two “Caitlin Star” books, especially book two, “Caitlin Star” and the Guardian of Forever”. Reading those books certainly is not necessary to enjoy “Caitlin Star and the rise of the Barbarians”. It really does function as a stand-alone adventure as the author skillfully peppers in all the backstory that you need. But that being said, the three “Caitlin Star” books do form a loose trilogy of sorts, and the first two books are very good, so I highly recommend reading those as well. What I loved most about this book the journey of the “Caitlin Star” character as she evolves (or devolves depending on your viewpoint) into the “Queen of the Forest” and the protector of a sort of Garden of Eden, the last remaining pristine patch of nature left on earth. Soon, enemies attack and how Caitlin and her over-matched friends of the forest deal with this makes for a riveting, action-packed science fiction action adventure. Filled with pop culture homages, “Caitlin Star and the Rise of the Barbarians” will be enjoyed by anyone who grew up on Robert. E. Howard “Conan” stories, movie buffs, and fans of the “Hunger Games” and “Divergent” series. This epic, page-turning, thrill-a-minute novel manages to do the impossible; act as a self-contained (and riveting!) stand-alone adventure, while also bringing the "Caitlin Star" trilogy to an emotionally satisfying conclusion. What makes this book so special is the introduction of new characters (mostly non-human), and the relationship Caitlin has with them. The book also manages to seamlessly work separate plot lines and bring them all together for a moving finale that made me quite emotional. There is so much great stuff in "Caitlin Star and the Rise of the Barbarians"! I cannot say enough about how much I loved this book! Vivid, visceral, exciting, intense, addictive and highly imaginative dystopian/post-apocalyptic young adult styled science fiction adventure. Skillfully told with memorable characters and a very emotionally satisfying ending. Very cinematic. Would make a fantastic movie. Immensely entertaining, fast-paced, intense dystopian adventure packed full of all sorts of great stuff (including time travel!) that kept me turning the pages. I loved Caitlin, and could see her carrying a movie franchise. All of the characters were interesting and fascinating, and the villains were great as well as being a formidable adversary for Caitlin and her friends. I just loved this book- it is unlike anything I ever read before and the writing really took me straight into the story and action. I did not read the first two books in this series but it did not affect my enjoyment of this book at all. The author did a great job and filling in what the reader needed to know without slowing down the story. Very well done and I can't wait to get started on "Caitlin" books one and two now! One of the most imaginative, action packed novels I have ever read. Filled with epic set-pieces, irresistible scenarios, and memorable characters, this book was so addictive I read it nearly nonstop, finished it two days, and can't wait to read it again. The writing is very visual and this (along with the first two books) would make an outstanding movie, especially with the right person playing Caitlin Star. She is about as fierce a heroine as I have ever come across and when she goes into action, things become very intense. The supporting cast in this book (many of then non-human) are beautifully developed. In addition to his knack for exciting action, the author has a gift for creating instantly memorable characters and great breezy dialogue. You really can read this a stand-alone adventure. 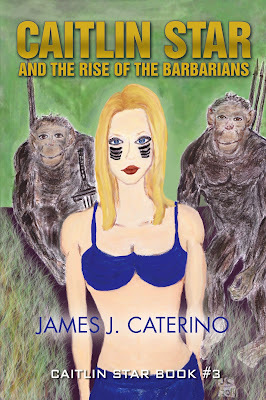 But the first two books are equally as entertaining and imaginative and the author wraps up several carry-over story-lines in a super satisfying manner as "Caitlin Star and the Rise of Barbarians" moves at rapid pace toward its moving conclusion. Impressive, fast-paced, visceral, contemporary post-apocalyptic science fiction action adventure with a great title character and strong visual writing. Many things set this book (and its prequels, "Caitlin Star" and "Caitlin Star and the Guardian of Forever") apart from the monstrous avalanche of young adult/new adult dystopian fiction out there. Unlike most of the YA dystopian female leads, Caitlin is not a reluctant action hero. Protecting others, seeking justice, and taking on the villains (well-fleshed out, worthy adversaries in all three books), is something she seems born too. As a matter of fact, at times she relishes it. There is a primal, savage beauty seeing Caitlin in action. She is fearsome, a character whose charisma just oozes off the page amid the author's streaming pulpy prose. There is also a unique multi-layered approach in the the book's thematic subtext that works on a cultural, political, sociological, and even religious level. The addition of a priest to Caitlin's supporting cast here is a stroke of genius. The non-human characters, especially Toby (a chimpanzee) and Krell (a neanderthal-like hominid) are very well developed. Returning from the previous books is Caitlin's hacker friend Lori as well as few special surprises best not spoiled here. The science in this book is also well done, and I say this as an undergraduate student of Anthropology and Archaeology. The imagined pre-history is entirely possible. Only the time-travel device comes across as science fiction-y (for lack of a better word). But even that is within the outer realm of possible quantum mechanics. But make no mistake, "Caitlin Star and the Rise of the Barbarians" is not an academic study. It is an exhilarating, page-turning, ultra-intense action adventure with unforgettable scenes, magical moments, and an an iconic lead character named "Caitlin Star"